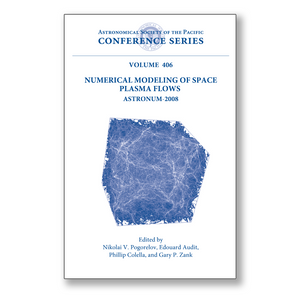 This volume contains the papers based on talks given at ASTRONUM-2008 -- the third in the series of international conferences organized by the Institute of Geophysics and Planetary Physics of the University of California and Institute for Research of the Fundamental laws of the Universe in the French Commissariat of Atomic Energy. The subjects of the conference included such topics as turbulence and cosmic ray transport; astrophysical flows; space plasma flows; kinetic and hybrid simulations; numerical methods, algorithms, and frameworks, data handling and visualization. All of these are of great importance for scientists investigating solar structure, the great importance for scientists investigating solar structure, the heliosphere, Sun-Earth connection, and various astrophysical phenomena. The problems discussed at the conference involved significantly different scales, regions, or particle populations, for which more than one set of defining equations or concepts are necessary to understand the physical system in its entirety. This book will be of interest for specialists in applied mathematics, astrophysics, space physics, and computer science working on the application of novel numerical algorithms to contemporary problems arising in these fields. It can also be used by graduate students to get acquainted with the fundamental approaches to solving fluid dynamics and Boltzmann equations governing space plasma flows.